of having dinner with your love one on an fascinatingly private beautiful sunset beach, visit one of the island's best resorts. "Samui Amanda Resort & Spa" surrounded by swaying coconut palms under a clear blue sky, simply promises you nothing but a pristine tropical paradise. Located on the sunset side of Samui island, lies Samui Amanda Resort & Spa, offering a quiet, peaceful and relaxing beach garden setting for your holiday needs. Slip away from the stress of daily life and be one with the natural surroundings yet enjoying all the comforts of a deluxe resort. Easy to access Island local Market and Nathon Pier (4 km), Handicraft and souvenir Shop, Coffee and bakery shop, Beer drinking shop, Government Center, Bank, Post Office and Police Station etc. Superior Garden View There are 27 bungalows with room space 30. 25 m2. Double and twin beds are alternative. The bathrooms are well-sized. The rooms all have own balcony where guests can sit outside and enjoy views of the private flower garden and coconut trees. Individually controlled air conditioner, IDD telephones, Satellite TV, A mini bar, Slippers, Private balcony. Deluxe Garden View There are 33 bungalows with room space 30. 25 m2. Double and twin beds are alternative. The bathrooms are well-sized with a shower. Individually controlled air conditioner, IDD Telephones, Satellite TV, A mini bar, Slippers, Private balcony, Tea and coffee making facilities. Deluxe Sea View There are 10 bungalows with room space 35. 75 m2. Most has double beds in the rooms. The bathrooms are larger size. The rooms all have own balcony and setting around the swimming pool so that guests can enjoy views of clear blue water in the pool, sea and the private flower garden altogether. Some rooms are located at beachfront which is the sunset best seen in this island. This is the paradise of many lovers in the world. Junior Honeymoon Suite There are 3 bungalows with room space 35. 75 m2. Most has double beds and special design for honeymooner. The rooms all have own balcony and larger-sized bathroom which setting around the swimming pool so that the lovers can enjoy views of clear blue water in the pool, sea and the private flowers garden altogether. All rooms are located at beachfront which is the sunset best seen in this island. This is the paradise of many lovers in the world. 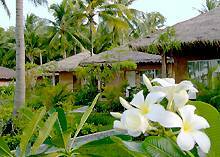 We are located in Koh Samui, the famous island for the beautiful beach. Nathorn down town 4 km. Full payment must be received no later than 7 days prior to arrival (15 Days for reservation during high and 30 days during peak seasons), unless credit facilities have been established with the resort. In case of cancellation within 30 days of check-in, no show, shortening of stay or early check out the balance of the total amount of the original booking will be charged directly by the hotel. In case of cancellation within 14 days of check-in, no show, shortening of stay or early check out, 1 additional night room rate per room reserved will be charged directly by the hotel. excess of the allowable number, or for each room not taken up. All conditions are subject to change without prior notice. Just 20 Kms. from Chaweng beach and 4 Kms. from Island downtown. Free transfer is provided to Chaweng and downtown everyday.